We have been waiting for a true The Hobbit: The Battle of the Five Armies trailer for some time now and it’s finally here! Sure, we got that Comic-Con The Hobbit: The Battle of the Five Armies teaser trailer, but a true, full-on trailer has been amazingly absent. And now, Warner Bros. has released it… and it is spectacular. We know that it will end with an astonishing 45-minute battle scene! The Hobbit: The Battle of the Five Armies trailer is being billed as the “final” trailer, which is fascinating because in this age of releasing a million teasers for a film, this Peter Jackson flick has had truly only two. Frankly, that is refreshing… keep ‘em guessing! The final chapter in Jackson’s The Hobbit trilogy lands December 17 and finds that battling the evil dragon Smaug is merely the beginning. They won the mountain, now they must defend it. 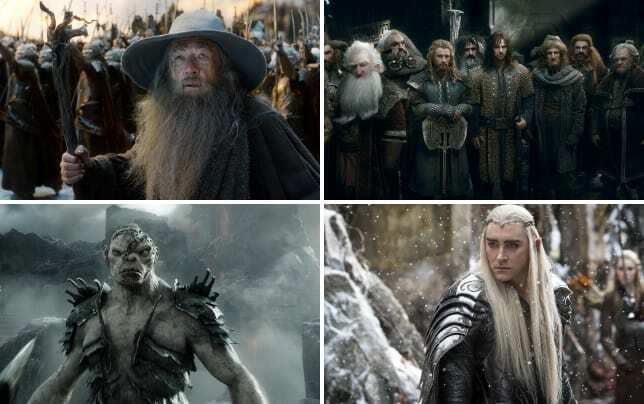 Martin Freeman returns as Bilbo, Ian McKellen is back as Gandalf and the superstar cast also features Cate Blanchett, Benedict Cumberbatch, Luke Evans, Orlando Bloom, Ian Holm, Christopher Lee, Hugo Weaving and Evangeline Lilly. Get ready for the final battle and watch The Hobbit: An Unexpected Journey online and then watch The Hobbit: The Desolation of Smaug online.